Cities can be destroyed at the click of a mouse button. 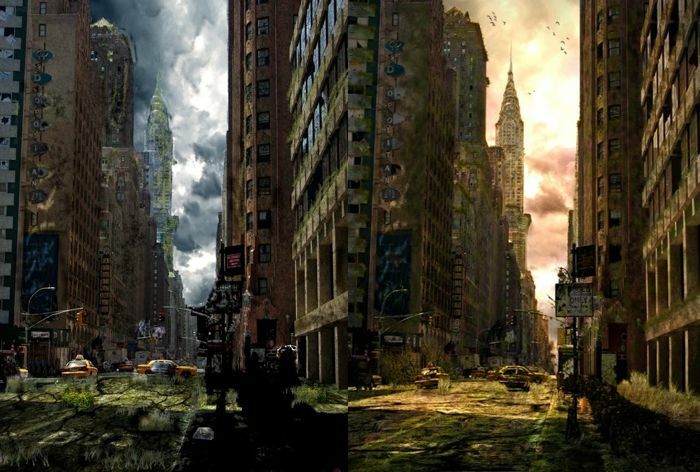 The ruins of New York are nothing new, we’ve seen them in countless movies as the stunning backdrop to end of the world tales. But how hard are these images to make? For film they typically do it with computers, and frame-by-frame paint what they want. Here I take a lesson in that kind of frame-by-frame painting- with just one cell. 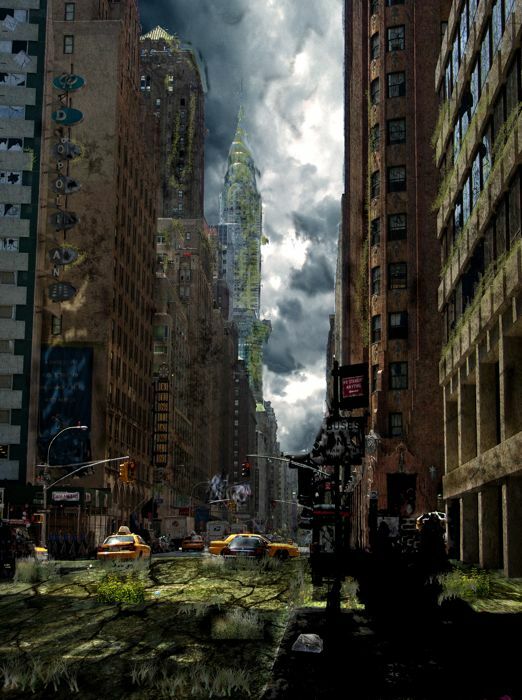 This is my first effort at destructing a city through Photoshop. I followed an indepth tutorial online here, and if you go to check that out you’ll notice I did exactly as the tutorial guy did, with the same images, in the same order. It was chiefly an educational chance for me to learn how to do it all, learn various Photoshop tools and techniques I didn’t know. The next image will be original, I promise. It took something like 4 hours to make this one. I spent a lot of time on small details, the windows, the grass, learning how to add textures with perspective, cloning people out, and so forth, plus in just figuring out the new tools. And you can spot some basic errors. My cutting out of the sky (to replace with moody clouds), especially around the Chrysler Tower, is imperfect. The ruined road only goes up to the start of the cars. The biggest impact tool is layering textures. That’s what ages all the buildings, and the road. Replacing the sky is probably next. Those steps don’t take all that long. The longer steps are all the fine details that you may glance over at first, that your eye will more explicitly notice if you look at the image for any time. Things that would only stand out if they were not destructed- like killing all the traffic lights, shredding all the flags, adding intricate cracks to the windows in the top left. Alright. I’ll see if I can prep an original image for next week. If anyone else fancies following the tutorial and posting their image/image link here, I’d love to see what they come up with. Let’s see if you can do it to the real thing! Nice one your first attempt. Are you going to invest in a Wacom tablet? 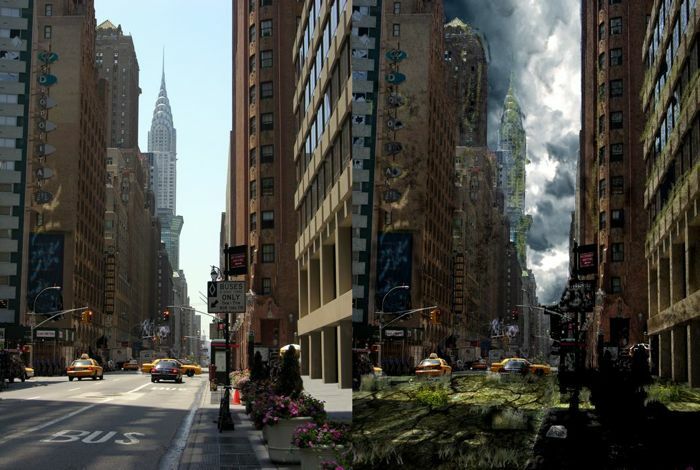 Check out stuff by Dylan Cole he’s the god of Matte paintings. His dvds by gnomon workshop are worth looking into. Dale- Cheers bud, mind racing with possibilities, hoping I can realize some of them. Adrian- Cheers, getting a tablet well, will have to see if this becomes more than just a passing fancy. Dylan Cole’s stuff is of course awesome, doing this thing (plus of course real painting) for real money. Very good results for your first attempt, Mike. The darker colors you’ve chosen give it a more “Out of Ruins” look than the tutorial’s example. I wish I had the time to learn more about photo manipulation, but my current neglected pet project is rolling my own blogging software.